I first saw Kit de Waal’s name earlier this year on a couple lists of highly-anticipated new books for 2018. 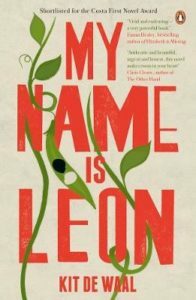 Since I rarely buy hardcover books and knew I’d have to wait a bit for The Trick to Time, I added her previous novel, My Name is Leon, to my wishlist and purchased it a few months later having finally found it in an English bookstore in Stockholm, of all places. After reading it, I can understand why people were excited for her new book. Beginning on the day his baby brother Jake is born in hospital, the story follows Leon’s increasing responsibility for Jake as his mother falls further into postpartum depression. Eventually, authorities are alerted and Leon and Jake removed into foster care. To add insult to injury, Jake is quickly put up for adoption and sent away to another family who only want a baby, leaving Leon by himself with the sassy but warm Maureen who has seen her share of children. But Maureen has health problems of her own and ends up in hospital, and Leon is shuttled off again, this time to live with Maureen’s sister Sylvia. While there, Leon discovers a nearby community garden and befriends the diverse group there whose interests and conflicts reflect the larger world of early 1980’s England: racial and nationalist strife, creeping poverty, and the royal wedding of Charles and Diana. Using a child’s POV in a novel for adults is a tricky proposition, but de Waal somehow pulls it off, with her own professional background lending a clue as to how: she spent years as a social worker and magistrate, so she knows this world inside and out. She uses third-person, limited to Leon, showing us the world through his eyes without claiming to use his words. Leon is smart and observant, more so than the adults around him realize, but he also has his blind spots and vices and is surprised that the adults notice all the little things he thinks he gets away with. He picks up bits and pieces of what’s going on in the greater world, but it isn’t until he’s swept up personally that we feel the full extent and power of those events. My Name with Leon is sweet but not saccharine, like many of my favorite British movies. (I’ve already dream-cast this movie, starting with Imelda Staunton, Celia Imrie, Bill Nighy, and Daniel Kaluuya.) This book was shortlisted for the 2016 Costa First Novel Award, and I’m still amazed that this self-assured and focused book was de Waal’s debut. Now I hope I can find The Trick to Time in paperback before the year is over. Ooh, your casting intrigues me!